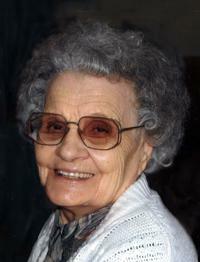 SARAH VIVIAN WOLSEY EHLERT HOARE of Magrath, Alberta passed away Monday, February 18, 2013 at Magrath Good Samaritans at the age of 99 years. Sarah was born October 14, 1913 at Taylorville, Alberta to John and Minnie Wolsey. Early in her life the family moved to Whiskey Gap where she completed most of her early schooling. The family later moved to Magrath where she completed her schooling. The move to Magrath also resulted in meeting Clarence Emil Ehlert whom she later married in the Cardston Temple. They resided in Magrath where they worked hand in hand building a family mixed farm. To Sarah and Clarence were born two boys, Brent and Richard. In addition to her farm labors Sarah worked at the Magrath Hospital and the Magrath Pharmacy. She was always seeking to do better for her family and made many sacrifices so that her children and husband might enjoy a better life. Her life changed dramatically in 1963 when Clarence became ill and passed away. After selling the family farm she moved to Cardston, then Lethbridge, then Edmonton supporting herself by clerking in pharmacies and managing ladies wear stores. She returned to Lethbridge in 1970 where she met and married Stanley Hoare. They took up residence in Calgary where they were both employed. In 1978 they retired and moved back to Magrath. Stan and Sarah served several missions for The Church of Jesus Christ of Latter-day Saints. Her love of gardening and flowers was exceeded only by her selfless acts of kindness and service. Sarah loved everyone. Sarah is survived by her two sons, Brent (Ila) Ehlert of Magrath, Richard (Leslie) Ehlert of Orem, Utah and two stepchildren: Michael (Betty) Hoare of Claresholm and Pat (Warren) Volstad of Medicine Hat, nineteen grandchildren, thirty-seven great grandchildren, and three great, great grandchildren. She is also survived by one sister-in-law, Carrel Wolsey of Magrath. Sarah is predeceased by her parents, five brothers: Milton(Della) Wolsey, Roy(Mona) Wolsey, John(Carrel) Wolsey, Ken(Peggy) Wolsey and infant Harold Wolsey and her husbands Clarence Ehlert and Stanley Hoare. The Funeral Service will be held Saturday, February 23, 2013 at 11:00 a.m. at The Church of Jesus Christ of Latter-day Saints, MAGRATH STAKE CENTRE. Friends may meet the family prior to the service from 10:00 to 11:00 a.m. at the church. Interment to follow in the Magrath Cemetery.